BS Honey Bees UK was formed by business partners & Bee Farmers Daniel Bates & Tristan Sawczuk in Gloucester, set in the beautiful countryside of the Cotswold's. Since 2011 BS Honey Bees has strived to be the lead producer, distributor & importer of high quality bees & queens. With hives based around a 15 mile radius of Brockworth, Gloucester. BS Honey Bees have a vast amount of colonies offering a huge variety of flora for the bees to forage on. 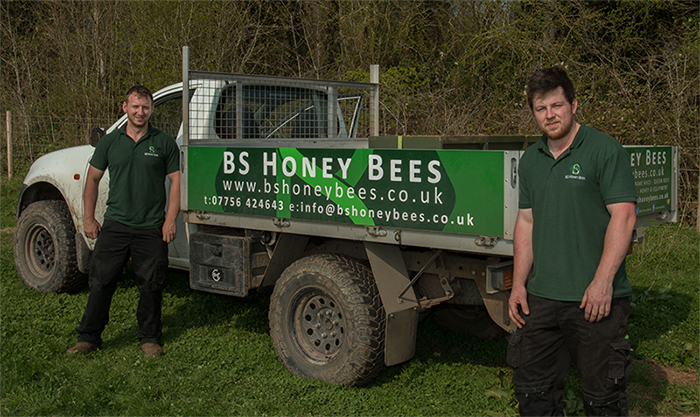 Daniel & Tristan are childhood friends, working together in commercial Bee Keeping operations down under & in the UK. Both fully DASH accredited (Disease Accreditation Scheme for Honeybees), they began BS Honey Bees as a joint venture only aged 21 with a wealth of knowledge behind them proving that bee keeping is not just something restricted to age. Both Daniel & Tristan are highly knowledgeable bee keepers at reputable Australian companies producing package bees for USA Export and vast queen rearing operations running up to 3000> mating nuclei at a time and maintaining 4000> colonies for honey & package bee production. With their expertise in Bee Keeping, vast multi talents in wood work, web design and everything the job role entails they set out to begin their dream. With no “farming” backgrounds living in normal residential estates and limited resources they still continue to work long hours dedicating their lives to their bees. Every year is different and each year teaches that little bit more about nature and how things do vary from year to year. If it’s not battling cold it’s battling flood water & rain. Each year shows a new challenge and we are able to learn and adapt to these. BS Honey Bees has a main focus in the industry, to provide the best quality and experience for the customer. The company has seen output increase and customer comments and suggestions taken on board to improve the overall customer experience, but if you do have any further suggestions or comments do not hesitate to contact us directly. BS Honey Bees is your number one specialised supplier of Full Working Hives, 5 Frame Nuclei, Package Bees, Buckfast Queens & Carniolan Queens. Located in the beautiful countryside of the Cotswolds on the outskirts of Cheltenham. We cannot be beaten for price or quality. For general enquires please via our simple to use contact form. Copyright © 2019 BS Honey Bees - All Rights Reserved. VAT Reg GB208092915.